Well I started last night and got the upper and lower hull parts glued together, no problems here and a good positive fit all round. I just popped in the drivers hatch to show the fit as I'm still undecided as to whether I fit a figure on this one. I next turned my attention to the suspension. Over on modelworx we have been having a discussion about the height of the finished model. One of the guys Chris who has built up the model said he thought the ride height was too low. I started by assembling one of the front stations and saw that it did indeed look slightly too low. I checked my references and pictures and I reckon that the suspension could do with dropping 2 to 3 mm. I then drilled and pinned the station I was working on and found that it was easy to drop the wishbones down to accomplish this. However when I added the drive shaft I found that this forced the wishbones back up. 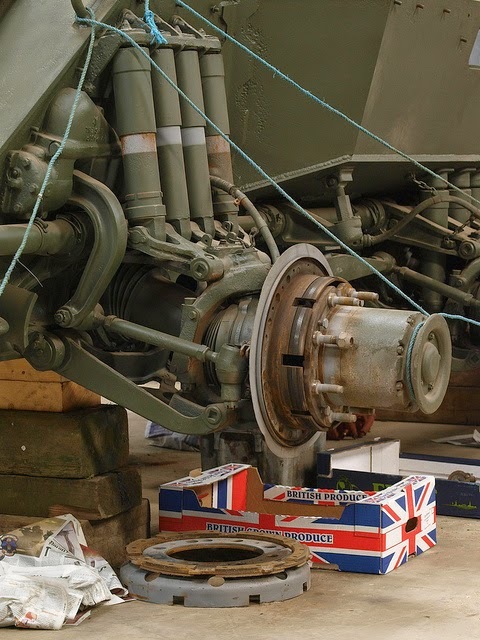 The drive shafts come out of the hull horizontally and as these are the main contact points for the wheels dictate the ride height. On checking refs again I found that the driveshafts should have a dog leg. My solution to this was to make new shafts from plastic rod which enabled me to drop the wishbones and also lower the hubs slightly. On the real vehicle the bottom of the outer wheel hubs should line up with the lower hull bottom. In the picture below you can see the modified drive shafts on the right. Below you can see the difference with the modified shaft on the left and unmodified on the right. Of course I know we are only talking a couple of mil here but I wanted to see how difficult it would be to adjust and come up with a simple workable solution. You can build the model as is and I suspect it wouldn't really make much difference to the look of the model. However it's always nice to have an alternative if you are so inclined. I have now made up the rest of the suspension parts and will glue them in place then use some spacers under the hull to get the correct height and ensure all the lower wishbones are grounded. The wheels and hubs are very nice indeed and the outer hubs have some cracking bolts on them. However be careful when cleaning these up as the sprue runners are very thick and connect to the part on the front edges. a good sharp scalpel and sanding though ensures a nice clean edge. As the Land rover is almost done I just had to start the Saladin as I've been desperate to start it every since I got my grubby mitts on the box! 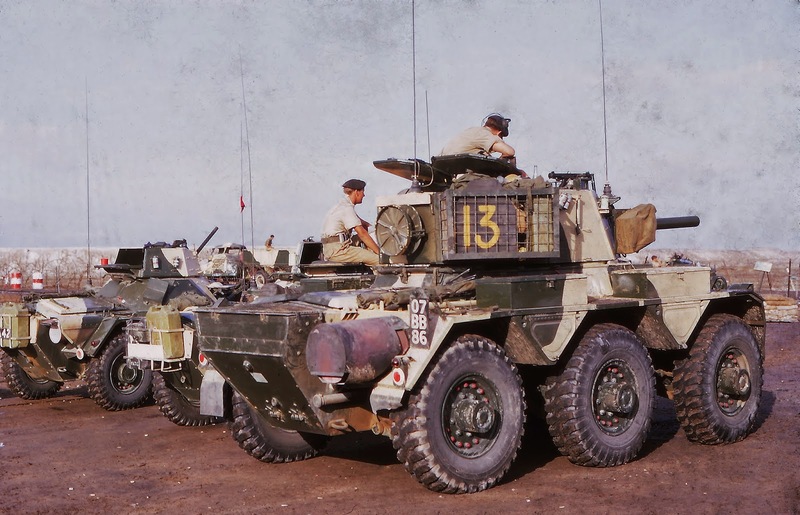 For this one (I intend to build another later this year) I'm going for an Aden campaign vehicle. 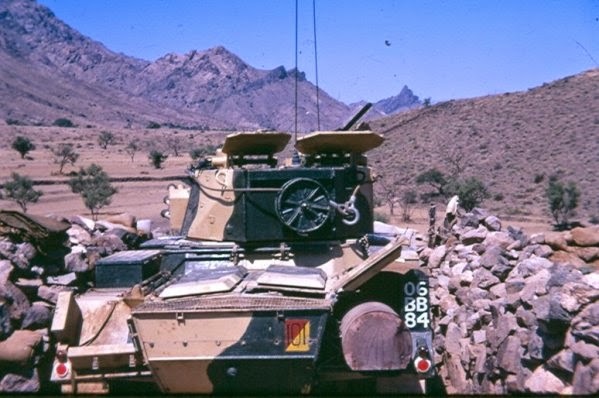 After a good look around the net I found some smashing pictures which show them in Aden and in colour! Very handy indeed. I will be adding any missing details as I go along as well. So stand by for an interesting build I think. I've been working on this on and off but have now done a bit more on the model. After painting all the red bits I sprayed a coat of gloss then painted the tow ropes. Today I added the decla sand also used some echelon IDF ammo boxes decals for the guns. Once they have cured I'll then add some chipping here and there and start thinking about stowage. I've now finished the 1 Tonne by adding the doors, windscreen and canvas plus mirrors and spare wheel in the back. Quite a bit of fettling was needed to get everything lined up correctly and here I used glue "n" glaze for most of the parts especially the windscreen. The drivers door was a challenge as the contact points for gluing were so small. In the end I made up a couple of tiny wedges which I glued onto the door brackets. Once dry I then glued the door to the vehicles side. By using the wedges it increased the surface area for gluing. I also used epoxy here to get a better bond than CA and to give it a degree of flexibility which you don't get with CA. After a final dusting with pigments she's now all finished. The only thing to sort out now is the base which I cannot start until I get the plaque which hopefully I will have next week. Yesterday I bit the bullet and started on the final weathering of the model. I started off with a heavily thinned application of tamiya buff, spraying this gradually to build up the effect. Most of the work was on the undersides and wheel arches. Once happy with this I then mixed up some pigments and added these dry to the interior of the model. The camo net and ammo boxes also had some pigments dusted on to blend everything together. I then added pigments to the exterior but tried to keep it subtle. It's now pretty much there with perhaps a bit more work to be done on the wheels. Lastly I tackled the glazing and here I used some very thin clear plastic from a packaging box which Brian S kindly gave me. I used the templates that I had prepared earlier on and cut them out with a new scalpel blade. After a polish I used deluxe materials glue 'n' glaze to secure the glazing and it all popped into the frames with no problems. I've just finished off the figure of the colonel and Jake his dog. The figures flesh areas were painted as usual using vallejo flesh tones built up over several layers. I then added some shading to deep creases in the uniform and lined all the pockets and seams with this mix. A very light dry brush followed to lift the uniform edges. For the belt I painted it blue then used a very thin piece of yellow decal to represent the regimental stable belt. I did find that no matter what I tried I couldn't get the strip any thinner as it kept breaking up so this slightly thick band will have to suffice. "Jake" the dog was a doddle to paint taking all of 10 minutes to do! I did however make up and paint a bag of his favourite treats, cheesy bites which will go into the cab of the landy later. I'm getting close to the end of this one now, just the glazing to cut and final weathering and assembly. And of course the base! Today I've painted up the figure in British DPM using my usual method and vallejo colours. I've slightly lightened the colours on the trousers for some visual difference. The maroon for the beret was a pig to get right and I had to do a few test mixes until I was happy with the colour. I've also been working on his faithful mutt, Jake who is a small rough haired terrier. My attempts at sculpting the dog failed miserably so I had a look around and found some nicely sculpted resin dogs from reality in scale. I have changed the ears on the dog to match Jakes little stubby ones! He should do nicely. The Land rover has now had a matt coat added and all the lights fixed into position. The weathering is quite light compared to my usual fare but in this instance I didn't want to swamp the model with too many filters and washes. I think it's come out well. All the bits for the back deck are now all done, I've also made up a vehicle documents folder and this will go somewhere in the cab. Once the varnish has cured it will be onto the final stages which will consist of a very light spray of tamiya buff and some pigments. I then have the task of cutting out and fixing in the glazing and fixing the doors, windscreen and canvas, I just hope it all goes together ok! The Achzarit has also had a bit of work in between working on the landy. I started off by spraying a heavily thinned mix of tamiya smoke and flat brown around all the details and panel lines. I then picked out all the handles and other fixtures that are red firstly using flat white then going back over with red. The white undercoat makes the red stand out more. That took quite a while to do but the model looks rather fetching with the red bits on now. A gloss varnish has been sprayed on today ready for further work once it's cured.